If you are getting ready to go on a trip and you are concerned about carrying on your toiletries, worry no more! These Carry-On Travel Bottles were designed to make it easy for you to breeze through security checks quickly and easily because they meet the 3-1-1 carry-on guidelines. They are neat and compact so they save room in your luggage too. 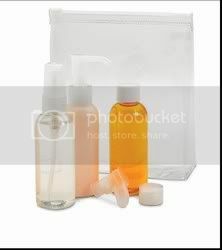 The kit contains: Four caps (two standard screw caps, one atomizer and one pump with locking cap to prevent spills), three 3oz bottles and one quart-sized clear plastic zip-top bag. Get It Now! This little book is my organizing bible. Donna Smallin gives the reader clever organizing tips on practically every aspect of your home and life. I refer to it all the time!